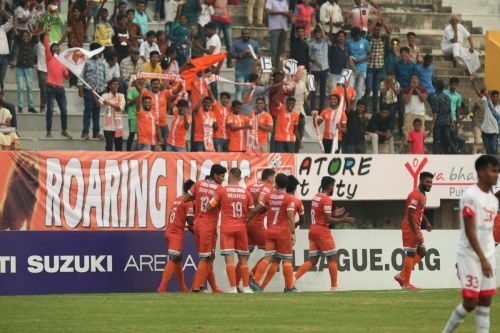 Leaving behind their disappointing loss against Real Kashmir, Chennai City climbed on top of the I-League table again with a superb performance against Shillong Lajong. A thumping 6-1 victory shows how dominant they were in the match. With 21 points from 10 matches, Chennai City regained the top position within 24 hours, three clear of the nearest rivals Neroca FC and Real Kashmir. Lajong stay at the bottom of the table with four from 10 outings. After a barren run, Pedro Manzi found his scoring boots again with an impressive hat-trick. A Nestor Gordillo brace and Roberto Eslava header was enough for Chennai to capitulate their rivals. The goal-fest started in the 12th minute and ended in 80th with a penalty. In between, Samuel Lalmuanpuia scored a consolation for Lajong. It was almost two months ago that Spanish player Pedro Manzi got his last goal, against Gokulam Kerala in 3-2 away win. Despite playing some matches in between, he couldn’t find the back of the net. After a brief injury which kept him sidelined for a couple of matches, Manzi was not looking that dangerous like he was earlier. However, the Uruguay-born forward silenced his critics with another impressive performance. Manzi took the league by storm after scoring a hat-trick in their opening match against Indian Arrows. Against last boy Shillong Lajong, he scored another. He is among the few players who scored two hat-tricks in the same season. Players like Odafa Okolie and Jeje Lalpekhlua have done that before. The last player to achieve the same feat was Cornell Glen three years ago for Shillong Lajong. He scored his first goal three minutes into the second half after being played a delightful through ball by Edwin Vanspaul. Manzi had open space in front o him with the goalkeeper to beat. He finished it of keeping his cool. He got his second in the 78th minute through another beautiful ball from Vanspaul and finished it off with a sumptuous volley. He got his hat-trick three minutes later when Vanspaul was fouled in the box and Manzi converted from the resultant spot-kick. He could’ve added more had he not missed the chances. He got two chances in the first half but couldn’t convert. Just before the final whistle, his striker from the box ricocheted off the bar. But that doesn’t take away his achievement. Finally, he got back into scoring and deservedly awarded with the man of match award. He now has scored seven goals – one less than Willis Plaza – and climbed to the second position in the top-scorers' list.